The 2015 Ford F-150's little 2.7 EcoBoost V6 will be able to tow 8,500 pounds with 325 horsepower and 375 lb-ft of torque. Official curb weight a 2015 F-150 SuperCrew Lariat, one of the larger models, is a slim 4,942 lbs. The current 3.7 base V6 is dropped for a 3.5, but the 3.5 EcoBoost and V8 from 2014 will remain. While specifics on the smaller F-150s hasn't been stated officiall, Ford's Communications Manager Mike Levine tells us that a 2WD SuperCrew (full four-door) 2WD truck with the 2.7 EcoBoost engine is more like 4,500 pounds. That makes a single cab even leaner. 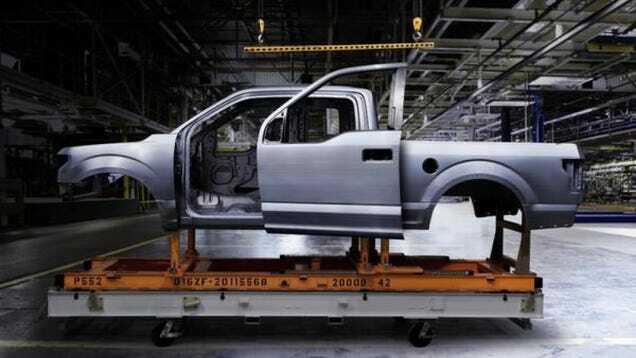 Just went we thought modern safety gear and consumer demand for huge cargo capacities would preclude the possibility of lightweight trucks coming back, it looks like Ford has made good on their promise to put their half-ton golden-goose on a diet while boosting capacities.